The historico-political “Baraja Constitucional” commemorates the declaration in Cádiz of the Constitution of 1812 and is dedicated to the Board of Commerce of Barcelona. Packs were accompanied by a propaganda leaflet celebrating the heroic figures depicted on the cards, such as Daoiz, Velarde and Riego, and the events leading to the Constitution. The four suits symbolise the Constitution, Union, Justice and Strength. The coins have been replaced by constitutional texts, the cups by bombs representing strength and the clubs by caducei representing union and commerce. Swords represent justice. The overall symbolism is reinforced by texts on the cards and suggests that through military strength and upholding the law, the constitution, Catholic faith, the monarchy and national rights should all be protected. Several editions were produced, in Barcelona and Madrid, with small differences in details where the outlines were re-drawn or inscriptions modified, until the constitution was abolished by Fernando VII in 1823 and production discontinued. The “Baraja Constitucional” was designed and created by Simón Ardit y Quer in 1822. 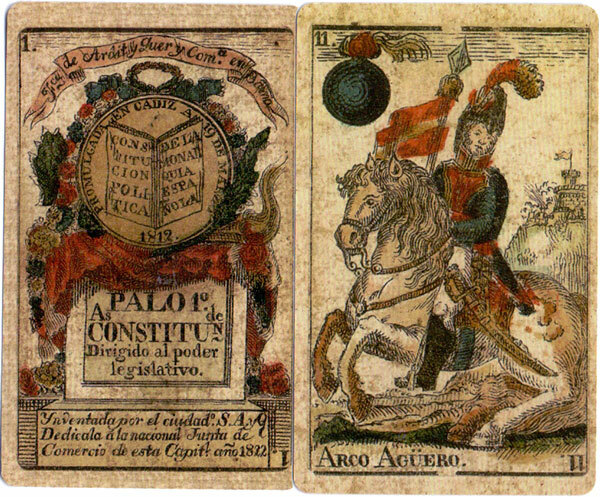 It is probably the first Spanish pack of playing cards to be printed using the recently invented method of lithography for the outlines, whilst stencils were used for applying the colours. The outlines were printed lithographically by Viuda e Hijos de D. Antonio Brusi, proprietors of the “Diario de Barcelona” newspaper, and then made up into finished packs by cardmaker Jaime Sandiumenge y Oliver. More recent facsimiles have been published by the Ayuntamiento de Madrid, Ediciones del Prado and Naipes de la Cigüeña. Above: facsimile edition of “La Baraja Constitucional” published by Naipes de la Cigüeña, Madrid, 1989. Ferro Torrelles, Victor: “La Baraja Constitucional” (with additional commentary by Alberto Pérez González) in La Sota no.18, Asescoin, Madrid, March 1998.